Of all the varieties of sinigang, I think chicken is not usually used on cooking the dish. The most popular Filipino chicken soup is called “tinola”. 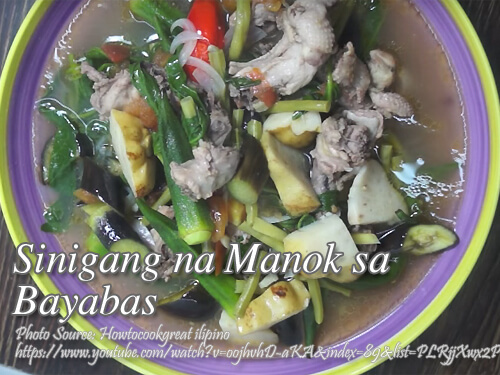 Pork is the traditional ingredient in cooking sinigang and the souring agent is tamarind. This chicken sinigang uses guavas as a souring agent and not tamarind. So better find unripe guavas or slightly ripe ones to get that sour taste of the dish. To cook sinigang na manok sa bayabas; In a medium sized cooking pot, heat cooking oil and saute garlic and ginger until fragrant. Add the onions and tomatoes then saute for one minute. Add the chicken pieces and saute for another minute. Pour water, cover and bring to a boil. Lower the heat and cook for about 30 minutes. Then add the guavas, sitaw, patis, salt and pepper. Let it boil for a few minutes than add the eggplants, kangkong, okra, and finger chili. Boil for another 4 to 6 minutes and it is ready to serve. To see the complete recipe, continue reading. In a medium sized cooking pot, heat cooking oil and saute garlic and ginger until fragrant. Add the onions and tomatoes then saute for one minute. Add the chicken pieces and saute for another minute. Pour water, cover and bring to a boil. Lower the heat and cook for about 30 minutes. Then add the guavas, sitaw, patis, salt and pepper. Let it boil for a few minutes than add the eggplants, kangkong, okra, and finger chili. Boil for another 4 to 6 minutes and it is ready to serve.